U.S. defense officials say the number of active-duty troops deployed to the U.S. border with Mexico will decrease to about 3,000 in the coming days. One defense official said these troops would likely remain on the border for the duration of the second phase of the border mission, which begins Saturday and lasts through January 31. The Associated Press was first to report the new deployment numbers. The new phase of the border deployment includes about half the 5,900 active-duty troops deployed at the height of the mission. Additionally, about 2,300 additional National Guard troops are continuing to support the Department of Homeland Security in a separate border security assistance mission. 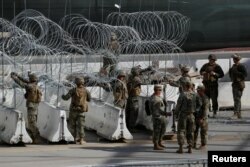 FILE - US Marines help to build a concertina wire barricade at the US-Mexico border in preparation for the arrival of a caravan of migrants at the San Ysidro border crossing in San Diego, California, Nov. 13, 2018. U.S. troops in California, Arizona and Texas have installed wire barriers, helped move around border patrol agents and protected those agents. President Donald Trump ordered the deployment of troops in response to caravans of Central American migrants moving toward the southern U.S. border. The number of migrants traveling to the border recently has declined. U.S. troops were initially deployed to the border in order to support the Department of Homeland Security through December 15, but Defense Secretary Jim Mattis later agreed to a request to extend the deployment until the end of next month.